On Saturday, February 8th, 1964, I was an 11 year-old boy, one who nurtured such a total disdain for the state of popular music as it then stood that my favorite singer was, by far, Al Jolson. That's right, folks--the fellow who regularly got down on one knee, face blackened in the now dubiously regarded but nonetheless historic minstrel show tradition, and beseechingly sang to his poor "Mammy"! Hey please understand, the guy WAS the biggest star in the world at one time, y'know, even if he DID peak just as the Roaring Twenties morphed unmercifully into the Great Depression. My dad always talked him up, y'see, and when television broadcast his bio-pic, "The Jolson Story", well, that was a major event in the Hembeck household, lemme tell ya! I sat enchanted in front of the tube as a fellow by the name of Larry Parks, in best proto-Milli Vanilli mode, lip-synced the master's bombastic crooning. Of course, a great deal of my initial fascination with the storied performer was directly due to his pivotal role in the history of American cinema: that being, namely his starring role in the very first full-length--if only partial--talking picture, 1927's "The Jazz Singer". "Big Bad John", sung with a grave solemness by future pork sausage tycoon, Jimmy Dean, made a lasting impression (I gave up ALL thoughts of pursuing a mining life, for instance...). And despite what's been said over the ensuing years in regards to the, ahem, "hidden" drug references in "Puff The Magic Dragon", I still have to fight back a tear every time I hear Peter, Paul and Mary sing of poor little Jackie Paper's sad if inevitable demise. OTHER, um, emotions were stirred up whenever I heard Brian Hyland's mildly salacious "Itsy Bitsy Teenie Weenie Yellow Polkadot Bikini", and the Rooftop Singers chart-topping "Walk Right In" was a perennial favorite as much for its innate catchiness as the for the cleverly modified lyrics the pint-sized Lenny Bruce's in my neighborhood invariably came up with, ever hoping to liven up the rather pedestrian words! What can I say? I'd been hopelessly smitten with the adorable British lass ever since I'd seen her up on the big screen in 1961's "The Parent Trap", which was home to this tune's first appearance. Apparently, the 45 RPM being a few years old by the time I moseyed along and gleefully snapped it up, it was most likely priced to move. That was just swell by me--it was a pleasant reminder of a rare if memorable afternoon spent sitting in a darkened movie theater, watching a tousle-haired goddess--times TWO! And, as it turned out, the song served as a portent of the future as well. Y'see, for those of you unaware of this now-mostly forgotten Disney ditty, sung by the English actress, the catchy chorus cheerfully repeats the phrase, "Let's get together, yeah, yeah, yeah!..." over and over. Though it may be exceedingly difficult for those of you who weren't there at the time to fathom, something ultimately as trivial as the length of these Beatle-boy's hair was more than enough to intrigue many a usually uninterested observer, myself definitely included. EVERYONE, man and boy alike, maintained a short hairstyle in the early sixties. Even our popular westerns heroes, proliferating as they were all over the tube at the time, had nary a stray lock hanging out of place under their ten-gallon hats, flying totally in the face of historical evidence that indisputably proved otherwise. We were, simply put, an uptight, regimented, buzz-cut culture. And here were four young men armed with the sheer audacity to literally let their hair down--hey, how could I NOT be intrigued? I liked what I heard. A lot. 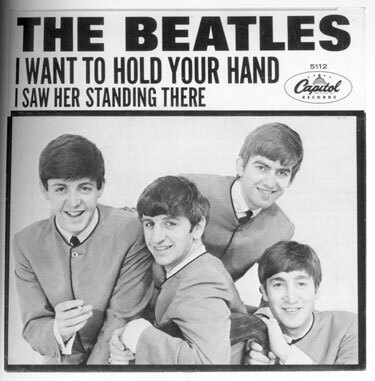 Soon after, I went out and sprung for my first fully priced 45, "I Want To Hold Your Hand" backed with yet ANOTHER even more brilliant B-side, "I Saw Her Standing There". Needless to say, I played it over and over and over AND over!! I vividly recall getting up early one morning--never a happy chore for moi, I assure you-- just so that I could give this precious piece of plastic a few extra spins before trudging off to school that otherwise-dreary day. Not long afterwards, I became the proud owner of one of those new-fangled tiny transistor radios, the dial of which was ALWAYS tuned in to NYC's WABeatleC--and NEVER far from my ear! THAT'S how my life-long devotion--some might say "obsession"--to John, Paul, George, and Ringo began. That's how I met the Beatles. The story hardly stopped there, however. To quote the first words uttered on the silver screen long-ago by my erstwhile singing idol, "You ain't heard NOTHIN' yet!" and indeed, folks, we hadn't.